Joseph McSweeney was just 11 months old when his mother Anna Lowry McSweeney died of cancer in March 1920 at the age of 24. Anna was the sister of my great grandfather Charles E. Lowry. After that, young Joseph was raised by his grandparents Michael and Anna Lowry in Salem, Ohio. He died in 1979 in Rehoboth Beach, Delaware. Joseph McSweeney (1918-1979), photograph, taken at unknown location around 1920; digital image, photocopy of original, scanned in 2013 by Joseph Lowry; privately held by Mary McCaffrey, [address for private use], Canton, Ohio. 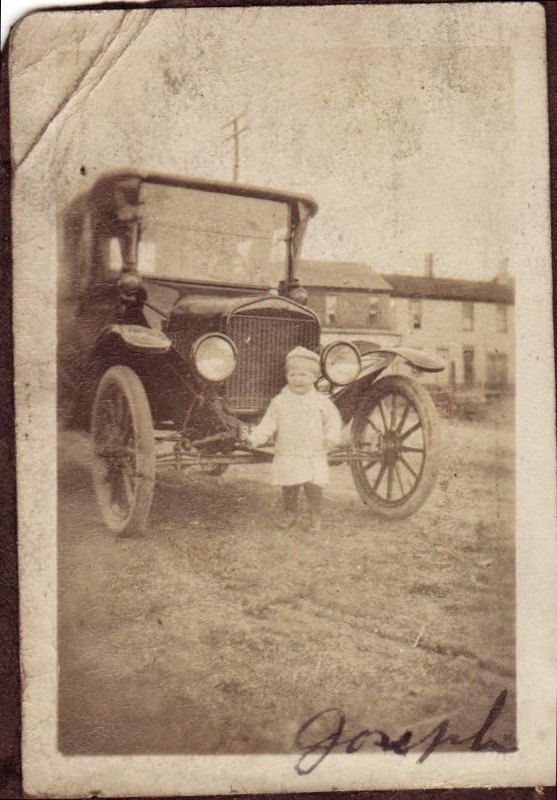 Young boy, approximately two years old, standing in front of Model T car. Provenance is Mary Pepperney Lowry to Charles Lowry to Mary McCaffrey. ← My DNA Says I Am From Where?! Joseph F. McSweeney, Jr. was my father. My name is Karla Anise McSweeney and I live in Wilmington, Delaware at this time. I adored my father who died in 1979. I was baptized with my father’s mother’s name.